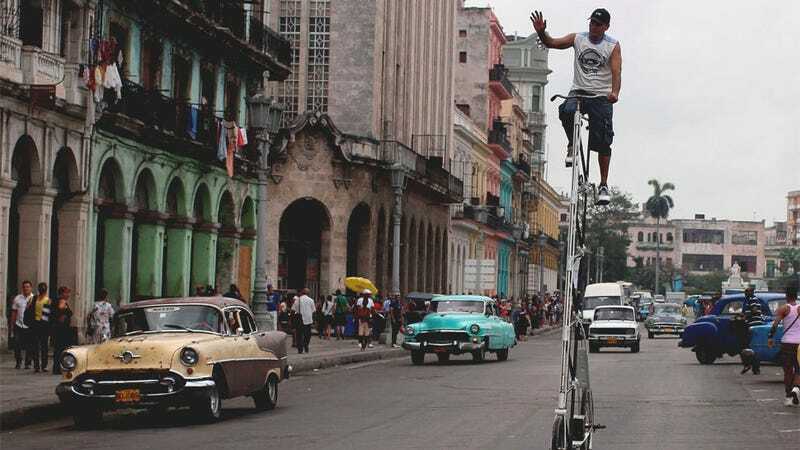 Sure, there's a guy in the picture riding on an 18 foot bike trying to make the Guinness World Record for tallest bike or something, but from a gearhead perspective, just look at the cars. I mean, I know we all know Cuba is the Land Of Big Surviving American Cars With Lada Bits On Them, but it's always arresting to see it. This is 2013. We live in an age of internet and PS4s and vibrating toothpaste and all manner of modern wonders, often with OLED screens in them. That picture there, with five of the roughly eight visible cars being mid 50s American iron (and one Moskovitch), that's an image taken now. Just thought a reminder wouldn't hurt.